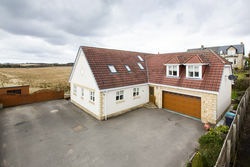 Situated at the bottom of a private road in one of Stepps most desired addresses, this substantial sized property was built by its present owner in 2007 and demonstrates a skilful design throughout offering generous sized rooms, bespoke features and impressively positioned with direct views onto the local farmland and Campsie Fells. Set amidst a small number of highly individual, architecturally designed homes, this unique residence offers 9 principal apartments of over 3000 square feet / 279 square metres and is comprised over two levels. The property is enhanced by certain noticeable features in the form of versatile accommodation and high end specification and design. On entering the property you are met with an impressively large reception hallway offering a lot of natural light from the feature remote controlled operated Velux windows positioned in the vaulted ceiling, the ground level offers hardwood oak flooring throughout the hallway and reception rooms. On the ground level the present accommodation comprises of a spectacular 26ft lounge accessed via double doors from the hallway, this particularly impressive room features triple bay window formation to the rear and French doors leading to the rear patio area. The formal dining room is accessed via a further set of double oak and glass doors from the lounge and is ideal for entertaining. 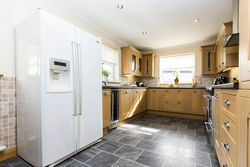 The dining sized designer kitchen is well equipped with plenty of wall and base mounted units and also features extras such as a wine cooler, sink disposal unit, a double AGA cooker, American fridge freezer and integrated dishwasher. On this level there are three further large rooms of which are currently being used as entertainment / games room, gymnasium and an office. These could be utilised in their existing layout but would also be suitable for additional sitting rooms / public rooms or bedrooms. 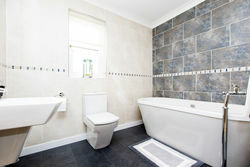 The fully tiled house bathroom is located on the ground floor and features a stylish three piece bathroom suite with feature freestanding bath. 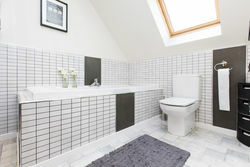 There is also a utility room and additional w.c on the ground floor. The first floor is accessed via a bespoke chrome and oak handrail to the upper level where the vaulted ceiling and Velux windows offers a modern design and natural light. 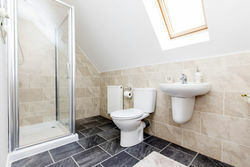 There are four further double bedrooms on this level each with their own en-suite shower room / bathroom and most with extensive built in wardrobes, each also with neutral carpets and décor and a large walk in storage cupboard in the hallway. There is also an integral double garage with an electronically operated door and could be used as a workshop. 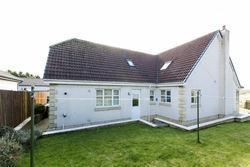 Property also has double glazing and gas central heating throughout. Externally the Property sits within a large plot, it is accessed via a private road from Whitehill Avenue, the front has been tarmacked to offer a large parking area ideal for multiple vehicles and enclosed with decorative fencing. There is a garden to the side of the property currently laid to lawn with bordering trees and shrubs. The west facing rear garden is breath-taking with an elevated decked area with patio door access from the lounge and backing directly onto the neighbouring farmland land offering unspoiled views of the countryside and Campsie Fells. 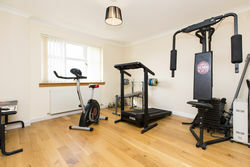 ''There were a few things that struck me when seeing this property for the first time of which was the versatility of the use of accommodation. This will appeal to larger families if more bedrooms are required but also to those looking for additional public rooms / office or recreational space. 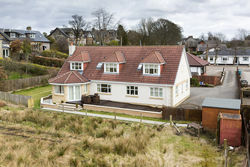 The views directly onto the farmland was in my opinion were idyllic and quite simply picturesque, it created a peaceful and private environment and will appeal to those seeking an element of privacy but within close reach of the local amenities and schooling. 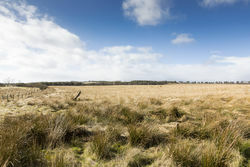 Amenities / Transport Links: Stepps is a highly regarded village in North Lanarkshire, a north-eastern suburb of Glasgow and a catchment for local well quoted schools at both Primary and Secondary levels. There are a number of local amenities and essential shops including, pharmacy, bank, take away, florist, hairdressers and a co-op. 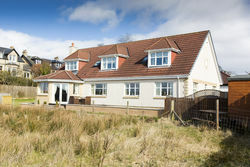 The village caters well for the outdoor enthusiasts and offers plenty of local leisure pursuits and parks including, pony trekking, tennis, golf, nature walks at nearby Cardowan nature trail and Frankfield Loch, Red Deerk Holiday Park also offers a bike hire. Further extensive shopping can be found at the nearby Forte Shopping centre just a short drive away where a variety of high street shops, restaurants, supermarkets and leisure facilities can be found and Glasgow city centre is only a 15 minute drive away. 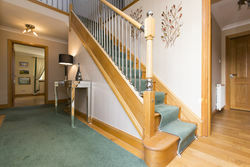 Transport Links: Stepps is excellent for commuters as its conveniently placed within easy reach of Glasgow city centre and Edinburgh via M8 motorway. 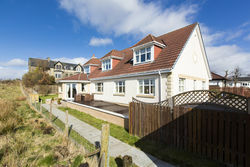 Whitehill Farm Road is located a short walk to Stepps train station. There is also a regular bus route to Glasgow city centre and neighbouring villages. Dining room 16'0" x 9'6"
Dining kitchen 23'3" x 9'5"
Utility room 9'0" x 7'6"
Master bedroom 19'6" x 16'9"
En-suite shower room 9'2" x 5'8"
Bedroom two 16'2" x 16'4"
En-suite bathroom 10'4" x 7'0"
Bedroom three 16'6" x 12'0"
En-suite shower room 10'2" x 5'2"
Bedroom four 14'5" x 11'9"
En-suite shower room 10'6" x 4'0"
Bedroom five/Games room 15'4" x 11'9"
Bedroom six/Gym 12'0" x 11'9"
The property is set back from the road and is screened on three sides by garden foliage. It is approached via a surfaced driveway with sufficient parking for several cars in front of the house and access to the double garage. There is a small well-kept garden to the side of the property. Adjacent to the rear of the property is a large feature raised timber decked patio and a substantial landscaped private garden. 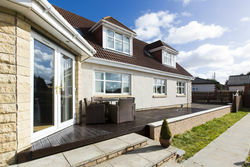 The patio and garden offer superb open aspects with views over the Campsie Fells. A timber shed is included in the sale. There is an integral double garage/workshop with an electronically operated insulated up-and-over double vehicle access door to the front of the property. The property is situated in an extremely convenient and sought after location and enjoys superb far reaching views over the open countryside to the rear. Stepps offers good local facilities including two primary schools, nurseries, local shops, a bank, tennis club and golf course. There are good public transport links including a local train station and bus service to surrounding areas and Glasgow city centre. The nearby M80 and M8 motorways enable easy commuting to Glasgow city centre and West Central Scotland generally. Services: All mains services. Gas fired central heating via radiators. Fixtures and fittings: Light fittings, floor coverings, curtains, blinds, double AGA gas cooker, dishwasher, wine cooler, waste disposal unit, washing machine and tumble dryer are included in the sale. 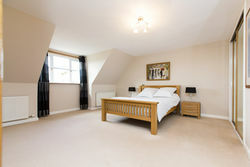 The house has sumptuous rooms of enviable proportions providing a high degree of natural light. 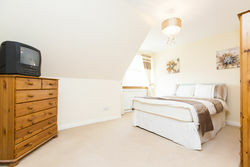 Internally, the property offers an excellent mix of apartments and has been finished to a high standard. 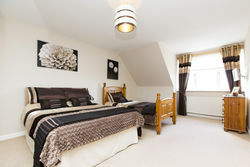 The property has a layout ideal for modern living and offers plenty of scope for entertaining on a grand scale. 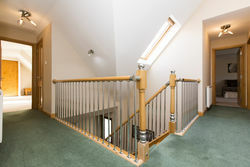 The accommodation comprises reception hallway which leads to all the principal ground floor receptions rooms and kitchen. The lounge is a most inviting bay windowed reception room with French doors leading out to the patio. 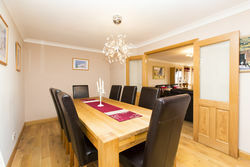 There is a formal dining room positioned off the lounge. There are three further reception rooms on the ground floor of the house, all of which could be utilised as additional bedrooms. The striking dining sized fitted kitchen has been built with no expense to spare. 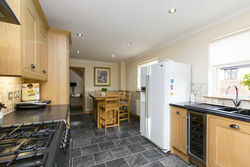 The kitchen is equipped with a full complement of appliances including Aga gas cooker, integrated dishwasher, American style fridge/freezer, wine cooler and waste disposal unit. 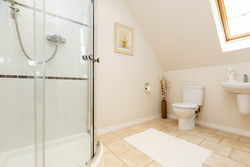 There is a utility room and two downstairs WC's. 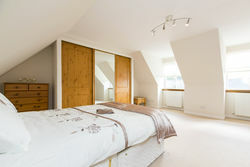 The upper floor leads to four double size bedrooms, all of which feature en suite bathrooms / shower rooms and quality fitted wardrobes. The views from the front elevation dormer project windows onto the neighbouring countryside are particularly attractive. The property is set amidst a very private garden which includes a lawned area, raised timber decked patio and a rich variety of shrubs and plants. 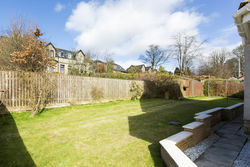 The patio and garden offer superb open aspects with views over the Campsie Fells. 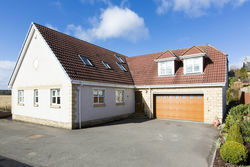 There is an integral double garage/workshop with an electronically operated up-and-over double vehicle access door to the front of the property. Further parking can be found on the monoblocked driveway. Gas fired central heating. Double glazed windows. A fitted alarm system is currently in operation. 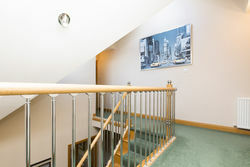 Stepps has an excellent range of amenities including local shops and mainline Glasgow railway station within walking distance. 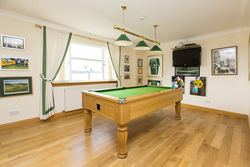 Bannatyne's private leisure club is a short distance from the house. Stepps also has a private Tennis club in the centre of the village. Glasgow City Centre can be reached via the new Stepps motorway link in approximately ten to fifteen minutes. There are some excellent, well quoted Primary and Secondary Schools within the area and a number of quality golf courses. The village also boasts a range of essential shops and services. HOME REPORT AVAILABLE UPON REQUEST. 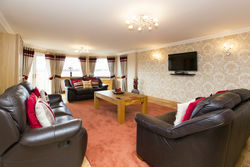 Viewings: Arranged by appointment, to confirm please call 0141 775 1050.